As you might have guessed, I am a big fan of oats. So, I LOVE granola. Sadly, since I’ve moved to Belgium I’ve been unable to find a granola that doesn’t have stacks of added sugar and unnecessary ingredients. As a result, I’ve taken to making my own. It’s super easy and literally takes 5 minutes, so I’ll never buy shop-bought again! Granola is basically cooked oats with all sorts of fruits, nuts and whatever other yummy healthy treats you decide to chuck in. So with wholegrains, protein and fruit it’s got everything you need to keep you going all morning. Plus homemaking your granola means you know exactly what’s in it. This particular recipe is an mixture of a couple of recipes I’ve found online, but as it’s so easy to tweak, it tends to differ slightly every time. 1. Preheat oven to 200 degrees C and lay greaseproof paper on a large, flat baking tray. 2. Mix together the oil, honey, water and vanilla extract. 3. Pour the oats into the mixture and stir well, ensuring every oat is covered. It may be easier to get messy and use your hands! 4. If you want to cook the nuts, seeds and dried fruit, add them now. I like my raisins slightly crunchy so cook them! Alternatively they can be added after cooking. 5. Place the mixture onto the greaseproof paper and place in the hot oven for about 10 minutes. 6. Stir the mix and bake for 5-10 minutes more until the oats are golden. 7. 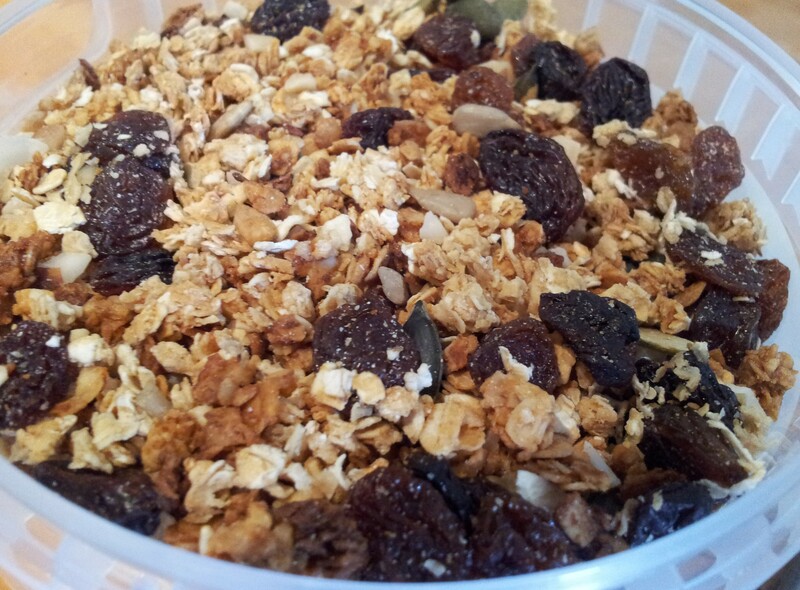 Let the oats cool and, if you haven’t already, add in the nuts, seeds and dried fruit. 8. Store in an airtight container! 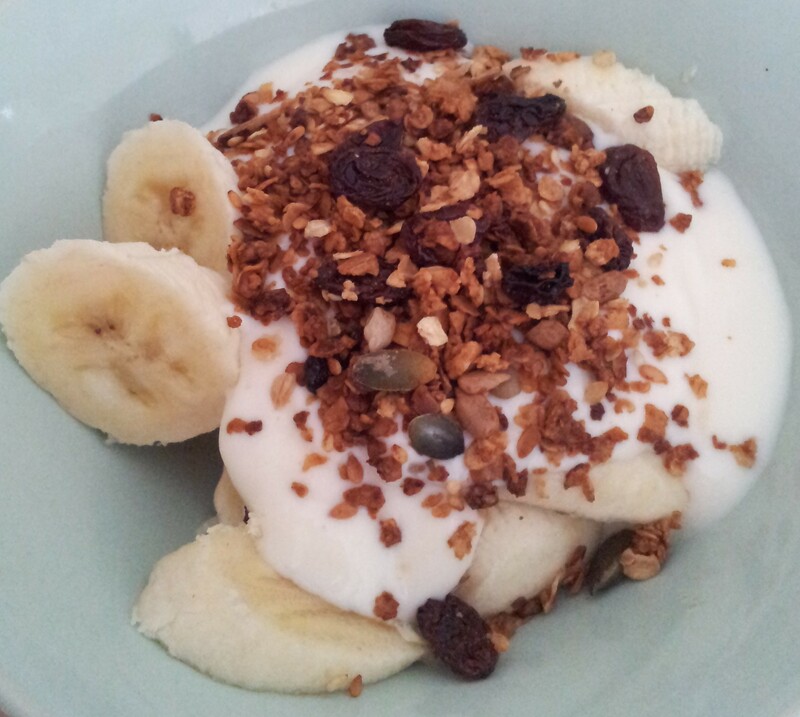 I like my granola with yoghurt and fruit. It makes for a quick, healthy and easy breakfast that I really enjoy. I’d love to hear your adaptations so let me know how yours goes!